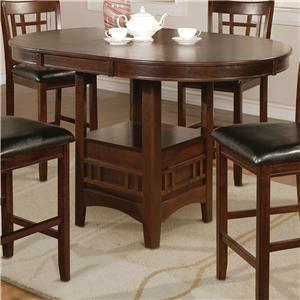 Sleek, stylish and functional, you'll love having this Counter Height Table in your dining space. The piece features a glass top with an open glass shelf right underneath it for a unique design and convenient storage. The glass components are supported by a set of tubular metal legs that truly reinforce the modern aesthetic. The Echo Contemporary Counter Height Table with Glass Shelf by Crown Mark at Casa Leaders Inc. in the Wilmington, Long Beach, Torrance, Lakewood, Los Angeles area. Product availability may vary. Contact us for the most current availability on this product. 1770T-4242-BASE Counter Height Table Base 1 0" 0" 0"
1770T-4242-GL Counter Height Table Glass Top 1 42" 42" 36"
Browse other items in the Echo collection from Casa Leaders Inc. in the Wilmington, Long Beach, Torrance, Lakewood, Los Angeles area.